Please select a Color & Size to view availability. Using an unbeatable combination of Cordura, 12.5oz denim and Coolmax, the Lombard Jeans are a moto enthusiasts dream come true. The modern slim cut means you can leave those Levis 511's in your closet and suit up with a pair of technical riding jeans that are tough as nails and super comfortable on or off the bike. That rugged Cordura Denim exterior is lined with PWR | shield panels in the seat and knees and, together with the included Knox Lite armor, gives you solid protection in key areas. Amazing Jeans. Stretchy and comfortable! I wish my other riding jeans had this stretch. Looks great and cool in summer on bike. Love these, way comfortable but also have padding. I owned these before and crashed in them. Held up great and protected me well. Reviews on various online sites. I was really excited for the color, fit, protection, and overall look of these motorcycle jeans. I'm a city rider who'd like to be as protected as possible while blending in as well. The Coolmax appealed to me immensely as I will be riding most immediately this spring and summer (which in New England are sacred short seasons). Unfortunately, these aren't made for my body type -- too tight, and the knee armor didn't cover my knees. Returning for the Philly (hoping for better luck)! These jeans are the best fitting moto jeans out there. Had an accident and my lower body took most of the injuries since I had no protective riding pants. My upper body was proetcted and my lower body was not. It showed. Styling, protection and I have been happy with Rev'it products so far. Good Looks and Good Protection, cordura weave, knee impact and hip impact protection. How does the PWR shell liner stack up to a liner like Kevlar found on other jeans? BEST ANSWER: Based on the PWR definition in the RevIt information page, it's like Cordura...which is like Kevlar...so basically it's the same thing, an extra protective layer in key areas. How much do these jeans shrink? I bought a pair of these in a 30x32, but the waist is closer to a 31-32. Should I try washing them (instructions say to never machine dry) or move down a size? BEST ANSWER: Hey... I had the same question, no guidance anywhere. So I called Revzilla, they said: Kevlar jeans don't shrink much. Nowhere near what a regular pair of denim will. So, get the size that's right for you, if they seem too big, they probably are. By the way, I'm a 36x36, and that's what I bought. The length is perfect. The waist is a size too big. Should have bought a 34x36. So, my experience seems to be the same as yours above. I also have to say, that the extra padding feels a bit too much. I know that's strange to say, after all, that's why I'm laying out $250 for jeans, right? But it feels like I'm wearing a quilt. I'd much rather have the kevlar, and maybe the knee pucks, and keep it to that. 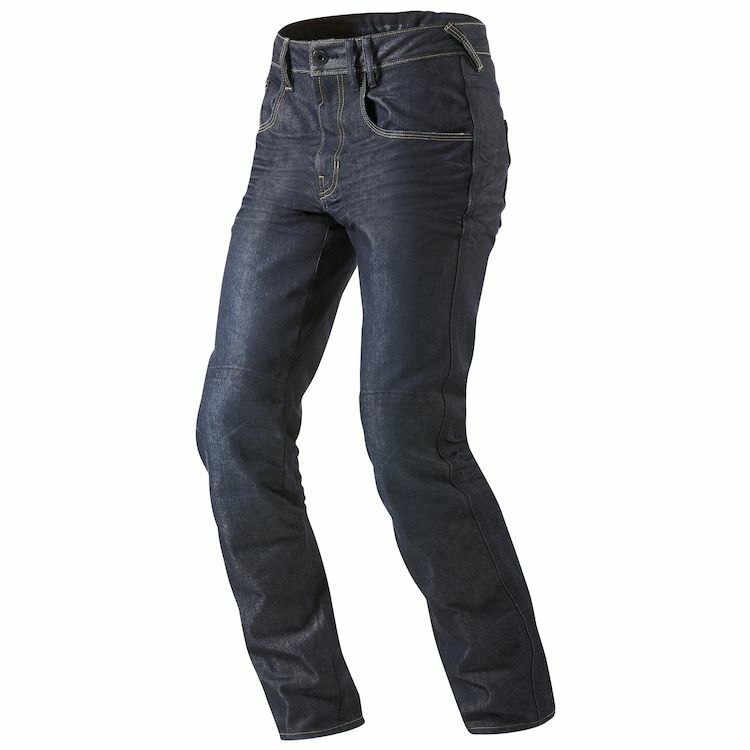 If I want serious riding jeans, I'll get them, these should be maybe more the lite version. I'll probably return mine for something else altogether. I found two issues with the pants. Will these fit over my Alpinestars SMX-5 boots? I'm 5'7 and ~145lbs. I usually wear levi's size 29x30/30x30. What would be the ideal size to get? It seems like they run big, but maybe someone has more input?? BEST ANSWER: I would guess 30W would be a bit too big for you. I normally wear a 31 or 32 and the 30W Lombards were slightly oversized in the waist (not a dealbreaker, but not perfect). You might want to try the 28W.